I have a serious obsession love for all things almond flavored, but I’ve never made marzipan at home…until this week! I originally had visions of marzipan fruit for the Christmas season, as my heritage might dictate, but then I decided to be realistic about my art skills. However, while marzipan can be rolled into a log and sliced into coins, to be dipped in chocolate or eaten plain, or served various other ways, I really wanted to highlight the moldability with something fun. 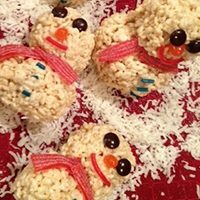 So snowmen it is! Because round spheres are about the extent of my sculpting skills. *If you’re nervous about using raw egg white, you can purchase the cartons of pasteurized egg white from the store or pasteurize them yourself. In a food processor or blender, pulse the almond meal and confectioner’s sugar until they’re combined. Add the almond extract and egg white and process until thick and smooth. Transfer the dough to the center of a piece of plastic wrap and knead a few more times to make sure all of the flour and sugar has been incorporated in the dough. Roll into a log and wrap in plastic wrap. Store in the fridge and bring to room temperature before using. 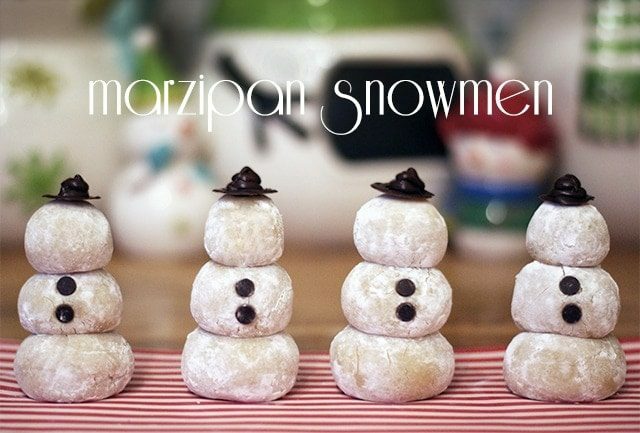 Pinch off a small amount of marzipan at a time to roll into 3 different size balls for each snowman. Roll each one in powdered sugar and then carefully stack them on top (if you’ll be transporting the snowmen, you may want to use a toothpick through the middle to hold the three pieces together). Gently press two mini chocolate chips into the front of the middle ball as buttons. In a small saucepan, melt 2-3 tablespoons of mini chocolate chips over low heat until smooth and creamy. Transfer to a icing bag (or plastic baggie with the tip cut off). 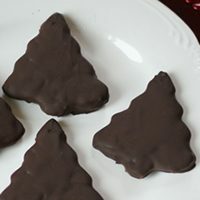 Carefully spread a small circle of melted chocolate on wax paper and let harden. Add a dot of chocolate on top and let harden. Repeat to make the hat taller. Gently peel the chocolate hat off the wax paper. 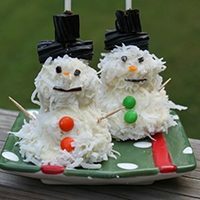 Add a small dot of melted chocolate to the top of the snowman’s head and place the hat on top.